Say hi / hello to get started.. 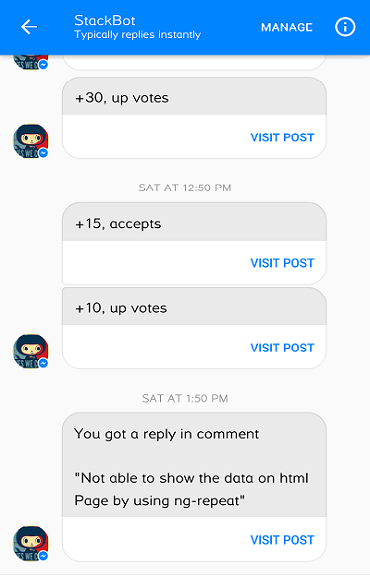 It sends unread inbox + reputation changes in Messenger once registered. Why did I create it? Who is it for? I believe it's made for the geeks (like me?) who are also addicted to this platform. It is currently limited to Stack Overflow, but it can surely be extended for other Stack Exchange platforms. 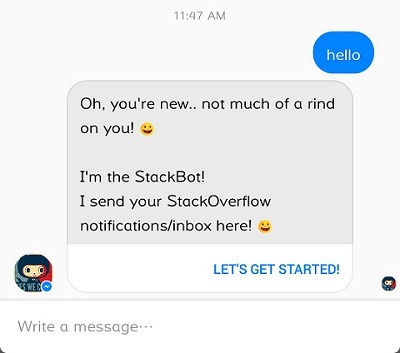 Once you register it with Stack Exchange, it polls for you every five minutes and sends any new / unread activity in your inbox / reputation in your Messenger. Built with Node.js + MongoDB + Bootbot. Deployed on Heroku and Azure.